Tired of losing your keys? I’m here to help. 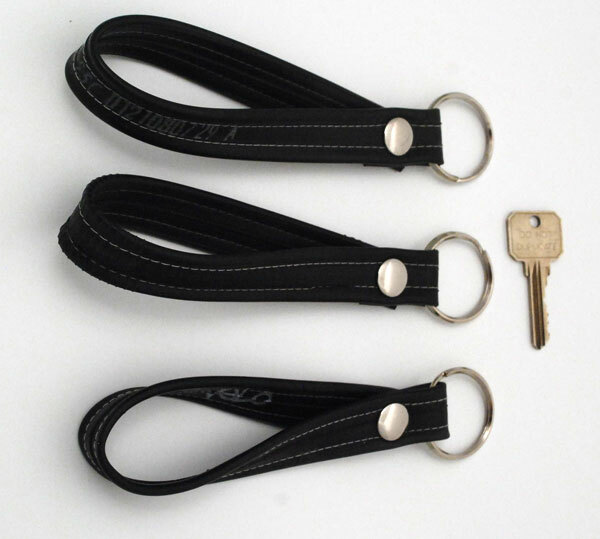 It’s a recycled bicycle inner tube key strap with a snap on the end so you can attach it to a belt loop, a purse, backpack, around your wrist…you choose. I recycled some plastic strapping from shipping boxes and put it inside the strap it so it won’t stretch. It also makes it sturdier. Comes in fabulous black with black or white stitching for that little extra bit of style. The inner diameter of the keyring is 1 1/4″. Plenty big for a hearty set of keys. The strap is approximately 10 inches in circumference, plenty big for a healthy wrist. A silver metal heavy duty snap holds it all together so you have one less thing to worry about.